HDMI Microscope Camera TUCSEN Metrics | SARRAS e.U. This model of TUCSEN belongs to the segment of its high-end microscope cameras . Equiped with a high-quality sensor (Sony IMX236), a lot of processing power and many software functions the camera provides convincing performance even in the most challenging lighting conditions such as in the dark field or fluorescence microscopy. Especially for industrial applications, the camera supports also in HDMI mode measurement and documentation functions. Multi-Signal Output: The camera can be connected directly to an HDMI monitor (standard use) or alternatively to a PC (via USB connection). You can also use both outputs in parallel as it provides the signal to both all the time. In both modes, the camera offers high refresh rates, ideal to keep track of microscopic movements and record them. Flexible Exposure Times: In addition to the auto-exposure, you can adjust the exposure time and the gain manually. The exposure time can be set between 1 ms and 10 seconds (step: 1 ms). Zoom – Mirror - Compare: Both the on-screen menu (HDMI mode) and the PC application (USB mode) provide zoom function and the possibility of mirroring the picture horizontally and vertically. In addition, you can split vertically the screen showing on the one half the live view and on the other an existing capture in order to be able to compare specimens. 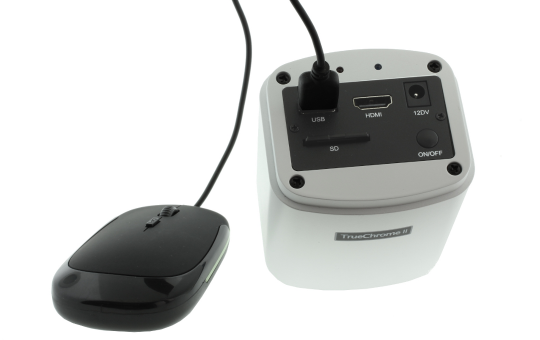 Built-in Mouse Control is a special feature of this model: in HDMI mode the supplied mouse can be connected to the USB port on the camera. With the mouse you can then activate the on-screen menu and record with his help, photos and adjust all the camera settings. 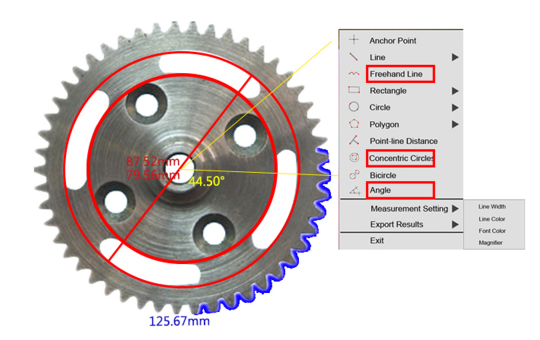 Extended measurement functions: The TrueChrome Metrics provides extremely powerful measurement functionality including: freehand lines, rectangles, polygons, circles, bicircles, angles, point-line distance and much more. 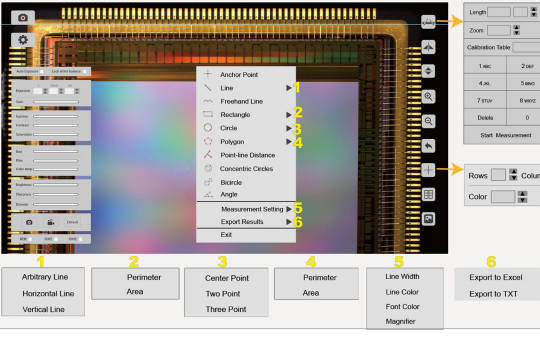 In addition to the ability to measure point-line distance, angles, the length of curves and lines, the camera can measure the perimeter & area of enclosed features such as: rectangles, polygons, and circles. 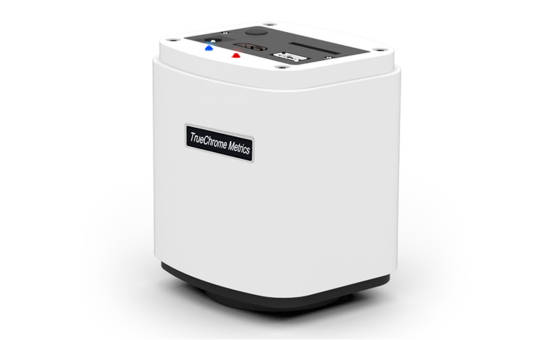 The unique calibration and magnification functions coupled with the ability to export the results to Excel or text files, make the measurements more convenient and simple. 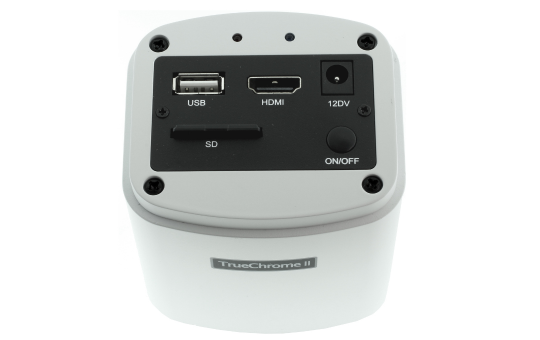 HDMI FL Imaging: Taking advantage of the ultra-high signal to noise ratio sensor, TrueChrome IIS allows you to set up to 10 seconds exposure time. The incredibly efficient 3D noise reduction performance delivers finest detailed images for low light fluorescence. Fast Video-Recording: The camera achieves recording in HDMI mode 30 fps at 1080P. Built-In Player: Previously taken pictures and videos are stored on the SD card in the camera. You can view and play them from the camera to the HDMI monitor using the gallery function - no PC is required!